Samsung Electronics, the world leader in advanced memory technology, today announced that it has successfully developed the industry’s first 10-nanometer (nm) class* 8-gigabit (Gb) LPDDR5 DRAM. 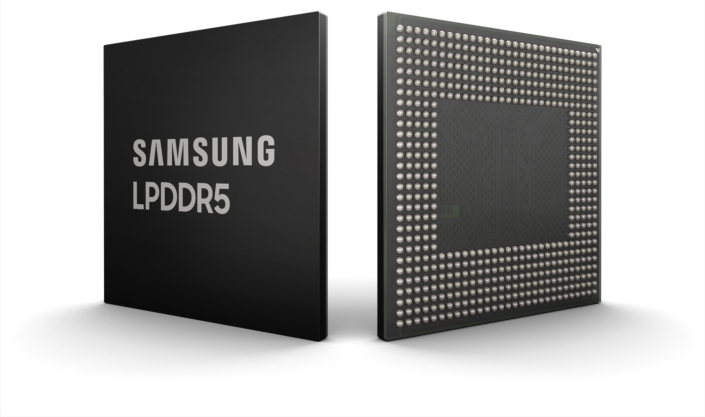 Since bringing the first 8Gb LPDDR4 to mass production in 2014, Samsung has been setting the stage to transition to the LPDDR5 standard for use in upcoming 5G and Artificial Intelligence (AI)-powered mobile applications. The newly-developed 8Gb LPDDR5 is the latest addition to Samsung’s premium DRAM lineup, which includes 10nm-class 16Gb GDDR6 DRAM (in volume production since December 2017) and 16Gb DDR5 DRAM (developed in February). The 8Gb LPDDR5 boasts a data rate of up to 6,400 megabits per second (Mb/s), which is 1.5 times as fast as the mobile DRAM chips used in current flagship mobile devices (LPDDR4X, 4266Mb/s). With the increased transfer rate, the new LPDDR5 can send 51.2 gigabytes (GB) of data, or approximately 14 full-HD video files (3.7GB each), in a second. The 10nm-class LPDDR5 DRAM will be available in two bandwidths – 6,400Mb/s at a 1.1 operating voltage (V) and 5,500Mb/s at 1.05V – making it the most versatile mobile memory solution for next-generation smartphones and automotive systems. This performance advancement has been made possible through several architectural enhancements. By doubling the number of memory “banks” – subdivisions within a DRAM cell – from eight to 16, the new memory can attain a much higher speed while reducing power consumption. The 8Gb LPDDR5 also makes use of a highly advanced, speed-optimized circuit architecture that verifies and ensures the chip’s ultra-high-speed performance. To maximize power savings, the 10nm-class LPDDR5 has been engineered to lower its voltage in accordance with the operating speed of the corresponding application processor, when in active mode. It also has been configured to avoid overwriting cells with ‘0’ values. In addition, the new LPDDR5 chip will offer a ‘deep sleep mode’, which cuts the power usage to approximately half the ‘idle mode’ of the current LPDDR4X DRAM. Thanks to these low-power features, the 8Gb LPDDR5 DRAM will deliver power consumption reductions of up to 30 percent, maximizing mobile device performance and extending the battery life of smartphones. Based on its industry-leading bandwidth and power efficiency, the LPDDR5 will be able to power AI and machine learning applications, and will be UHD-compatible for mobile devices worldwide. Samsung, together with leading global chip vendors, has completed functional testing and validation of a prototype 8GB LPDDR5 DRAM package, which is comprised of eight 8Gb LPDDR5 chips. Leveraging the cutting-edge manufacturing infrastructure at its latest line in Pyeongtaek, Korea, Samsung plans to begin mass production of its next-generation DRAM lineups (LPDDR5, DDR5 and GDDR6) in line with the demands of global customers.